As summer approaches and the warm air drifts in, grills are lit all across the country. 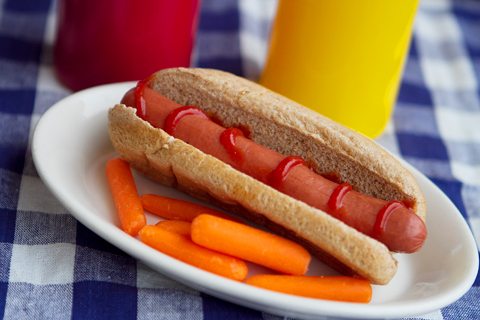 Summertime is hot dog time, but hot dogs have come under recent scruple f or being riddled with unhealthy nitrates. But this doesn’t stop the voracious American appetite when it comes to consuming one the country’s iconic meals. Over several billion hot dogs will be eaten between Memorial Day and Labor Day alone. So where’s the alternative to such a classic dish? Here at Smart Lunches, we found the answer through Applegate Farms and their commitment to all natural ingredients, free of any antibiotics, hormones and nitrates. Applegate Farms is responsible for all-natural beef franks that are significantly lower in fat than average hot dogs and provide a healthy and just as satisfying alternative. Smart Lunches and Applegate are committed to providing you this healthy hot dog so you can still enjoy all the dishes you love. Smart Lunches serves select Applegate Farms organic beef hot dogs every week on whole grain buns with ketchup and mustard on the side. So you can let your kids enjoy their hot dog without having to worry about the ingredients inside. Previous: Previous post: Lunchers are in Luck this St. Patty’s Day! Next: Next post: Happy Teacher Appreciation Day!